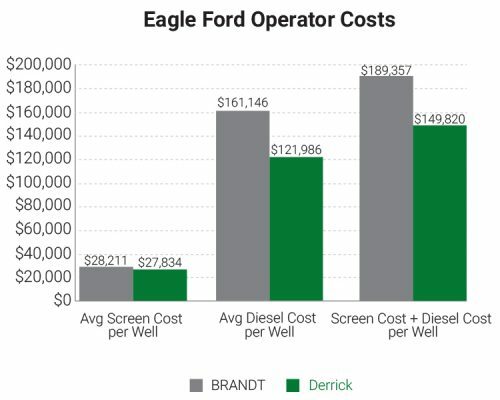 11 wells in the Eagle Ford were compared by diesel consumption, screen cost, and depth. 7 wells were drilled utilizing BRANDT® KING COBRA™ shakers with OEM screens and compared to 4 wells drilled with Derrick® Hyperpool® shale shakers equipped with Derrick Pyramid® screens. The Derrick Hyperpool shale shakers and Pyramid screens saved the operator more than $500,000 over one year. Derrick reduced the average amount of diesel used from 55,760 gallons to only 42,210 gallons per well utilizing the Hyperpool’s patented screen compression system eliminating bypass thereby removing more solids from the system. Cost savings were derived from actual screen bills and diesel cost. Diesel cost was $2.90 per gallon. Total screen cost and total diesel cost were used to calculate the total $500,000 savings generated by utilizing Derrick Hyperpools with Derrick Pyramid screening technology. BRANDT and KING COBRA are trademarks and/or registered trademarks of National Oilwell Varco. Download to discover how Derrick’s equipment reduced fluids cost.